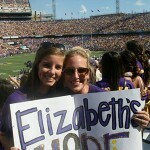 September brought events for Pediatric Cancer Month along with more campus events for Elizabeth’s Hope. We are grateful that so many of our Campus Ambassadors are helping pass the torch to the next generation of Elizabeth’s Hope supporters. 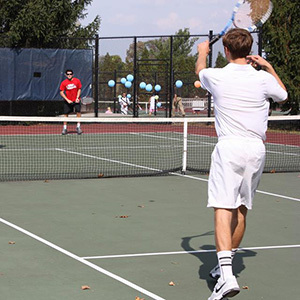 A big thanks to Lilly Santoro for serving up the Second Annual Mixed Doubles Tennis Tournament for Elizabeth’s Hope at Gettysburg College in October. The tournament was initiated last year by Elizabeth’s friend Erin Hackett, who generously helped Lilly take the reins of what we hope will be an annual event. This event is especially meaningful to us, since tennis was Elizabeth’s sport. Thanks, Erin and Lilly, for carrying on this tradition in her name. Many thanks to Brenda Ries in New Jersey and her sister Angela Moore in Kansas for an extremely active September! Angela is COO of eScreen, which made the Children’s Brain Tumor Project the beneficiary of its company-wide fundraising campaign. Brenda and her son Sean have been tireless advocates for pediatric brain tumor research, and they led the GOLD OUT campaign at sporting events in September. 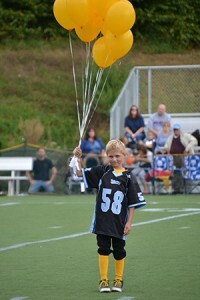 At one game Sean released golden balloons, each of which bore a tag with the name of a child who lost the battle. Sean’s balloons honored Caitlin, Ty, Bizzie, Brooke, Juliana, and Elizabeth. We are so grateful for this family’s support! Thanks to our friend in Louisiana, Kathleen Clark of “What’s YOUR Fight?” for organizing the Second Annual Tailgate Saturday on October 12 at the LSU Parade Grounds in Baton Rouge. 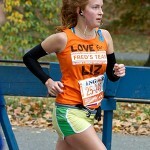 Last but not least, a very special thanks to our running friends, including Emily Kuschnar of Team Zachys, who ran in the October 13 Westchester Running Festival to support the Children’s Brain Tumor Project, and Caitlin Hudson, who ran the New York Marathon on Fred’s Team to benefit research at Memorial Sloan-Kettering Cancer Center.